After the tragic death of her boyfriend, Emma has come to the graveyard at night for the peace. But one night while at the graveyard, something different happens when she runs into the new kid at school, Eric, and a mysterious old lady dressed in ragged clothing. And on this night, Emma’s life will change forever. The characters in the book were very likeable. Emma, the main character, was very determined and headstrong. Eric was very mysterious, and kept me in stitches while I was trying to figure out his story. Chase, Eric’s friend, was mysterious and hilarious at the same time. Allison, Emma’s BFF, was a great friend, very caring and loyal. The one character I really found myself caring about was Emma’s friend Michael, as he is autistic. As an aunt to an autistic niece, I always love seeing these characters included in a story. Getting to see into their world, even briefly, is always interesting. It took me a while to get used to the writing style in the book. I found myself confused at times, and I would have to go back and reread what I had just read to try to make sense of it. After a while, I did get used to the style though. The storyline was definitely a bit on the darker side, but I love that snarky comments were thrown in on occasion. Overall, I found this to be an enjoyable read with interesting characters and storyline! I’m really looking forward to reading the next book in the series. I loved Michael. He was a great character and it showed Emma's softer side as she looked out for him. Sagawa's other series that I read was somewhat bouncy, too, so I was used to her writing style. Maybe that's why it seemed a bit smoother to me. I love dark stories! And characters that make me laugh win my heart! This sounds like a pretty good read, I'm adding it to my wishlist !! 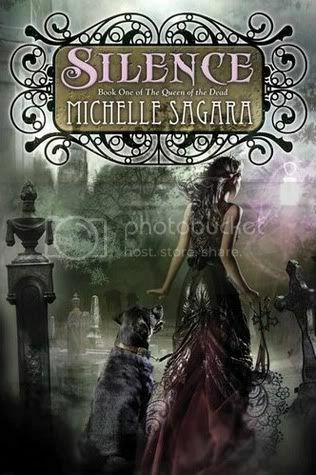 The cover lookd both creepy and pretty, love it !! Thanks for the great review Christy :) !! I haven't seen this one around before, and I admit the description doesn't grab me much, but I like your review - perhaps I'll check it out if I see it on shelves somewhere. This is the second review I've read that said the characters were enjoyable but the writing took some getting used to- I'm so glad to know that upfront! Now hopefully it won't be as much of a problem for me:) Fantastic review Christy! This one looks fun and new. The cover is stunning, too. So this is actually the first review I've seen of Silence, but I've been looking forward to this book for some time now. I am really psyched that you liked it - and I like that the cast of characters was different and likeable. Sometimes authors don't pay enough attention to their secondary characters. I really cannot wait to read this. Awesome review, Christy! sounds like it had a different style, but it sounds excellent!